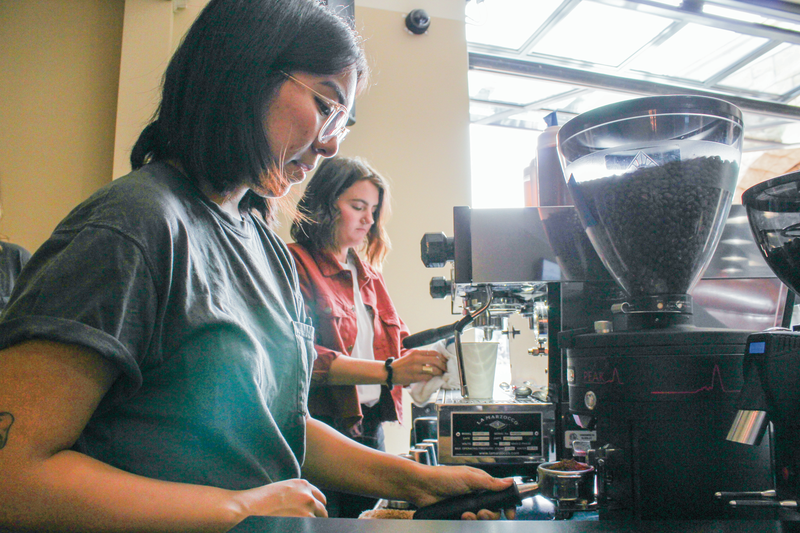 Madison Santana | Banner Deziree | Little, 23-year-old barista at Arcade Coffee Roasters, said she loves to serve commuters at Wake Up Wednesday each week. Commuting students risk missing out on the typical college experience because they could be less available for on-campus activities. Despite this challenge, it is important for commuters to stay connected as college can provide opportunities to meet new people and develop a sense of belonging on campus. Samantha Emerick, sophomore business administration major, said although responsibilities outside of school take a majority of her time, she has found ways to stay connected at California Baptist University as a commuter by attending sporting events and club fairs. Taylor Altizer, assistant director of Campus Activities for Community Life, said they are committed to helping students understand the different ways they can get involved. In an effort to keep commuters up-to-date with on-campus events, Community Life sends out a monthly email newsletter called the “Commuter Scoop,” which contains a list of events happening each month. Altizer said students who wish to get more involved on campus should be present and devote time for campus-related activities. “Showing up is the first step to involvement whether that be committing to spending time in the Commuter Lounge each week to meet new people or deciding to stick around for an event even when being at home sounds more comfortable,” Altizer said. The Commuter Lounge, located in Cottage 1, is open weekdays from 7 a.m. to 7 p.m.
Community Life encourages students to attend the Commuter Sidewalk Café in Stamps Courtyard on the first consecutive Wednesday and Thursday of each month. At the Commuter Sidewalk Café, students can enjoy free breakfast and coffee, enter in giveaways and learn about other upcoming campus activities. CBU offers a wide variety of involvement opportunities for all students, including on-campus clubs, intramural sports, outdoor adventures and cultural programs. Community Life recently sent out a survey to all commuters to gather feedback to help navigate the future of commuter student programming. “Looking toward the future we want our students who commute to feel like active members of the CBU community, which starts with us hearing from these students and seeing what we can do to address their needs,” Altizer said. Jazmin Oseguera, sophomore biology major, said she noticed the effort Community Life has made to improve com- muter involvement. “It’s hard being a commuter sometimes because if I want to go to an event, I have to plan for it but I feel like CBU recognizes that and makes a good attempt to keep us informed and updated through social media and email,” Oseguera said. The next planned commuter event is the Commuter Christmas Party, which will be held Dec. 4 at 2:30 p.m.